Outside of peak season you can also reserve a Chambre d’hôte. In wich case you will be granted use of your own comfortable (2p) bedroom. Towels and breakfast will be included in our price. 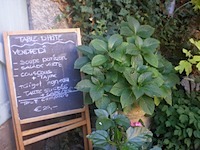 If you wish you can also reserve a delicious diner with us on our well filled ’table d’hôte’. 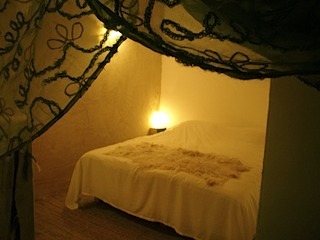 A comfortable, large, double room (25m2) with large cozy (twin) beds and tastefull interior. On the ground level you will also find the bathroom with a shower, a sink and a toilet, as well as your private balcony where you might want to enjoy your breakfast. On the first floor, in the pleasurable mood of your comfortable livingroom (25m2) with it's lovely wooden structure, decorated with authentic furniture, you can enjoy a glas of wine next to a fire in the wood burning-stove. During the day you can enjoy the high light and the view on the courtyard and the gates. 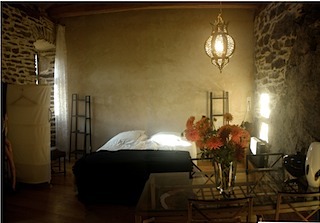 In the ample two-person room (30m2) with it's fascinating wall of natural stone and it's lovely wooden frame you can enjoy a comfortable (twin)bed, the cosy glow of the woodstove and the surprising and tastefull interior. The shower in morrocan style and the toilet are on ground level. In your comfortable and light room you'll find that there is enough space to write at your table, read a newspaper or have your breakfast served might you desire so. But nothing prevents you from doing so on one of the Mas's many terraces. A small enoyable two-person bedroom on ground level could be coupled with the reservation. In the grand old century Cevenol house you can find two comfortable and carefully decorated doublerooms equipped with twin beds on the first floor. De both bathrooms can be found on ground level. You could enjoy your breakfast at the wonderfull cederwood table inside or on the breat, covered terrace whilst looking over the vast valley. Before diner you could contemplate your cevenol adventures whilst gazing at the flames in marvelous fireplace of the livingroom, and enjoy your glas of wine or homemade fruitjuice. An enoyable two-person bedroom on the same floor could be coupled with the reservation.